Saint Reagan who did no wrong, except all those things the modern Republicans don’t talk about, believed in Trickle Down Economics. The theory is that if the people at the top get to keep a lot more of their money by paying less in taxes, their money will eventually trickle down to those below them through increased job opportunities and better wages. It gave birth to the phrase “job creators”. Now, consider that under the three Republican presidents, Reagan and the two Bushes, who supported Trickle Down Economics, and skipping over the Democratic one, Clinton, who didn't, and who accumulated a surplus, not much has actually trickled down. Not all that many jobs have been created. As a matter of fact the majority of jobs created were those overseas which allowed the people at the top to make more money because they could pay lower, third world wages, and put their increased riches in offshore banks where they didn’t have to pay taxes on it. Those overseas jobs were the ones taken away from American workers. So those who were supposed to be creating jobs for American workers didn’t. 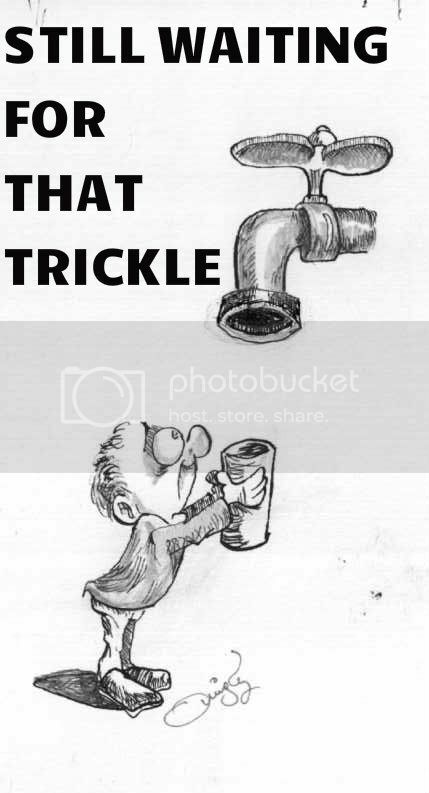 Nothing trickled down. We are now in a recession with high unemployment that should not have happened if this theory is a true one. It has been thirty years while this theory was really pushed, so where are the jobs? Oh, that’s right, President Obama was supposed to somehow pull it all together in spite of the very adherents to the theory constantly voting against things like the Jobs Bill that might have created the jobs we are told the “Creators” would come up with. Cutting the top tax rate does not lead to economic growth. Cutting the top tax rate does not lead to income growth. Cutting the top tax rate does not lead to job creation. So, again, I ask where are the jobs that the creators have had thirty years to produce? And why is no one making the "job creators" create them?